The Duck lives in a city where everyone else’s lives are so interesting and important, they seem to have a purpose even in their everyday life. The Duck, however, is having strange symptoms and anxiety, and it is only when the doctor diagnoses the condition as fear of flying. The Duck should try it but its muscles ache. It admires the swan’s dancing and graceful flying. It puts on a tulle skirt and imitates the swan’s elegant movements, in secret behind a tree. But the Duck cannot fly – it only falls on its beak! The Ducks journey of gaining confidence and forgetting about what others think, is told with a fresh voice and illustrated in bold colours by a genious pairing of established talents. 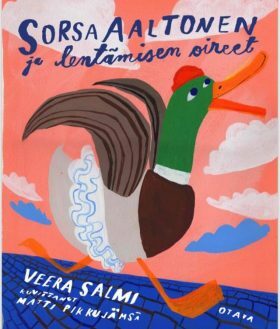 Veera Salmi’s wise, urban tale is brought to life in the magnificent paintings of Matti Pikkujämsä.